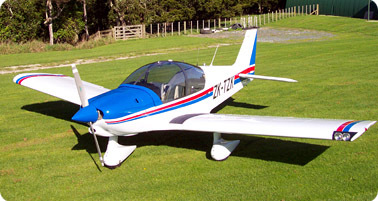 The Alpha 120T is a recently released variant featuring a more economical 118 hp Lycoming engine. Based on the proven R 2160 design, which has been extensively tested to the plus-4.4/minus-1.8 G acrobatic limits, the aircraft is carried on a very robust oleo-pneumatic undercarriage. The engine is an O-235 Lycoming, renowned for its modest fuel consumption (typically 21-23 litres/hour), and offering an unmatched 2400-hour recommended TBO. The 120T's modern lines, low wings, high-visibility bubble canopy, together with its high levels of comfort and superior handling, all add up to superior appeal for student pilots and instructor alike.